From NFL analyst to fans, the criticism of Johnny “Football” Manziel has been loud and clear. In the opinion of most, Manziel will go down as the greatest college player since Tim Tebow. The 5’11 quarterback may be short in stature, but his heart and determination stood above the rest of his counterparts at the same position. The Texas A&M quarterback won the Heisman Memorial Trophy as a red-shirt freshman, to go along with a runner-up finish one year later. The Heisman is the most prestigious award in college football. This award is not easily won, yet Johnny Football won it. Florida State’s Jameis Winston had a masterful season by leading his Seminoles to an undefeated season, along with a National Championship. These factors prevented Manziel from repeating as a 2-time Heisman winner. Going into the draft each prospect attends the NFL Combine in Indianapolis, Indiana. All attendee’s are expected to showcase their physical attributes to team scouts, coaches and owners. The combine allows college quarterbacks to perform throwing drills and board-work relating to running offenses and breaking down defenses. Manziel did not participate in the necessary throwing drills, citing he would rather perform at his college pro-day. Some analysts believe he hurt his draft status by not performing. Of the top QB prospects, Central Florida’s Blake Bortles impressed everyone by making all the necessary throws needed to succeed at the next level. Manziel is being harshly criticized for his life off the field. He is a 20 year who basically does with most kids his age does. The media and fans in general are making a big deal of it due to his free-willing lifestyle. Having the financial means and star-studded friends has hurt Manziel’s popularity also. 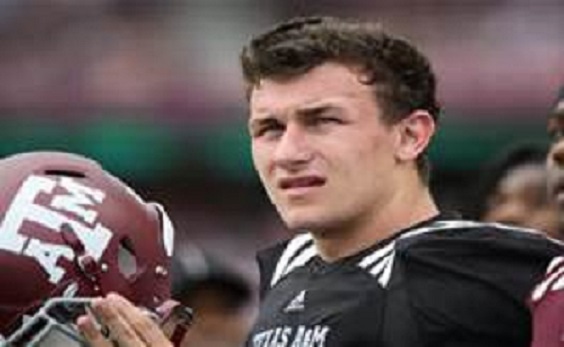 The perception of Johnny Football seems to be one of a “young punk” who gets and does what he wants. Unfortunately, a perception such as this can follow a person for a number of years. NFL analysts are extremely critical of his size and so-called quarterback mechanics. The pundits of Johnny Football have given the impression of totally disregarding his statistics over the last two seasons. In comparison to Manziel’s 4,114 yards, 37 touchdowns and 13 interceptions, Blake Bortles finished the season with 3,581 yards, 25 touchdowns and 9 interceptions. Louisville Cardinal Quarterback Teddy Bridgewater had 3,970 yards to go along with 31 touchdowns and only 4 interceptions. Most NFL analyst believed Bridgewater’s numbers were inflated due to the lesser competition they faced in the American Conference. Johnny Football is in the process of proving all his critics wrong. He took a giant leap forward after his performance at the Texas A&M pro-day. Johnny Football came out and showcased his ability at the highest level. He answered all questions pertaining to his quarterback mechanics, throwing strength and athleticism. Manziel put on a show and awed NFL personal by making long throws on the run with touch and accuracy. Being the showmen he is, Manziel performed his pro-day in a uniform, pads and a helmet. He wanted to show NFL organizations a different type of pro-day as compared to the traditional no pads pro-day all quarterbacks use. Both media and fans should get off the back of Johnny “Football” Manziel and allow him to prove himself on the field. What he does off the field is really no one’s business.